Good morning! Happy December - or should I say DIEcember? 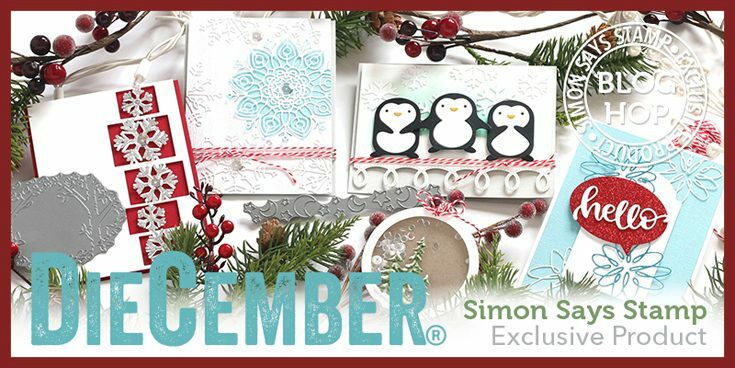 Yes - it is officially the month that Simon Says Stamp celebrates die cutting! There is a FABULOUS new release - packed full of lots of NEW dies, and also some fabulous new glitter paper! I'm excited to be participating today in day 1 of a fabulous 2 day Blog Hop to celebrate - with giveaways and inspiration at every stop along the way! I decided to make a card using entire die cuts - and was able to use two of the new die sets I received, paired up with a couple dies from previous releases! I started off with one of the Nested Talk Bubble Dies, and die cut the one that would fit the fun new Oh Hello There Wafer Dies. I die cut it from dark chocolate cardstock, and the words from white cardstock. I added the adorable Picture Book Monkey to the bottom - layered together and with a bit of Copic and white gel pen accents - on a piece of white cardstock cut with Drifting Stitches Borders. Used foam adhesive to adhere some of the layers together, added some jute twine tied around the bottom, and then covered the words with Tonic Crystal Glaze to help them pop a bit more! GIVEAWAY INFO: Simon Says Stamp is giving away a $25 coupon at every stop along the hop - so make sure and leave some love as you hop along for a chance to win! Winners will be announced next Wednesday on the Simon Says Stamp Blog. Really cute cards! The nested talk bubble dies add so much dimension. I think they will be very useful for all kinds of cards. Great,now I have to get the Bubble dies! Lol! Really cute cards Heather! Especially love the snowflake card! Very cute cards,love the bright pink snowflake card! Thanks! My 2 year old grandson adores Curious George and your cute card got me 'needing' that die! Very nice cards. Love the snowflake dies and the pink just makes it better. There is tremendous beauty in the simplicity of design with these cards! I absolutely love,love, love them!! Love these new dies SSS has presented. So perfect for the holiday! My favorite are the snowflakes and hello. Lovely card designs! Thanks for all the great samples today. 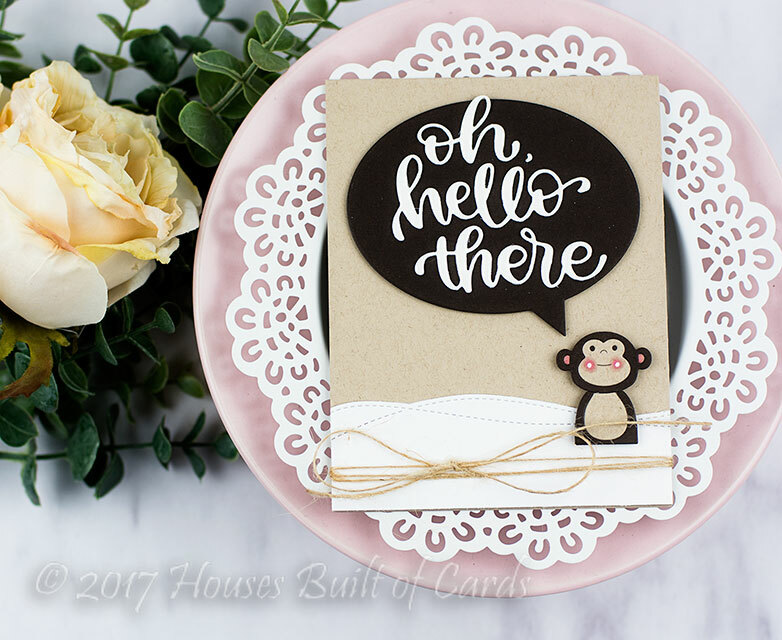 Love that adorable monkey and the "oh hello there" die! Such a sweet card! Lol, love this cheeky little monkey, he's so cute and the plaid is beautiful with the pink glitter paper. Great cards Heather. super cute card and all dies! i have never done that. I am loving that "oh hello there" die. your second project was pretty too, i love all the new snowflake dies and what girl can resist glitter paper? not me, that's for sure. Wonderful cards. This is such a special release. That monkey card is wonderful - such a sweet, cheeky little guy! Adorable!!! I love the "oh hello there" die! oh my I love that little monkey! great dies in this release. Beautiful cards! That glitter paper and those snowflakes are just meant to be together!!! That little monkey is adorable! Makes a great focal point for a card! Thanks for sharing your talents with us. Loving this new SSS release hop! Cute cards...the monkey is adorable! Love the first card. It is so cute. And the second card is just stunning! Especially love the touch of pink sparkle! Love your cute monkey card and the second card is so elegant, love the pink!! Beautiful! That little monkey is so cute. Love the pink on the second card. OMG!! Your monkey card is so stinking cute!! And I love that beautiful pattern paper you put behind your sentiment on the second card! Beautiful cards! I love colours and patterned combinations. Love how each card is different. Love! So sweet, love the monkey. How adorable! I love the monkey card for it's my favorite. Love that giant speech bubble! My daughter's nic name as a little girl was Monkey! This is a special card for me. Thanks. So adorable. Love the monkey. Love your cards--especially the one with the adorable little monkey! Love the pink snowflake card! Monkey cad is cute too. These are so cute! I love that adorable little monkey! The bright and festive hello look perfect for the holidays! 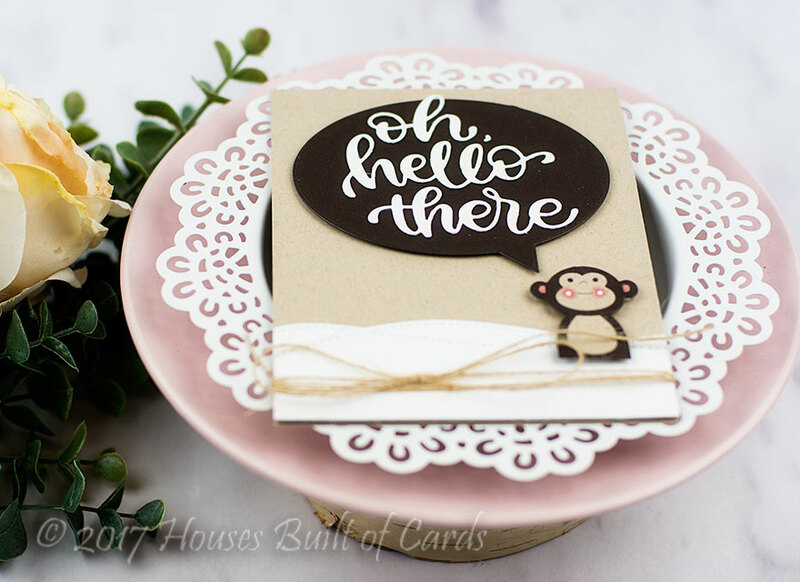 What's not to love with pretty plaid, and that monkey card is so cute! Love them both! So, so cute!!!!! LOVE these card designs!!! Fun and colourful cards. And another great release from SSS. Love that you created an entire card with die-cuts! What great inspiration. Thanks so much. That monkey die is so darn cute - your card is so fun! Oh, such fun and pretty cards all in one! These two cards are just darling. The plaid card is wonderful - so much color and bright. Hi Heather, I love the Monkey card. My grandson loves curious George, so this would be perfect for him!! This is such a wonderful release, I had already put the snowflake dies in my cart and now I have to go back and put the money die in too! Very cute cards--I love the adorable monkey! The snowflake dies and glitter papers are beautiful. Great new release. That monkey is so cute. I love the nested thought bubbles, I have wished in the past for different sized thought bubbles. Great cards thanks for sharing. What super cards! The little monkey is so cute! Both cards are lovely. But that monkey card is adorable. Such fun cards! The first one made me smile and for the second one I squealed! I LOVE the new glitter paper colors. Both cards are awesome! That monkey is to cute. Cute card with the monkey and I love the snowflake card. The pink and blue plaid goes so well with your design. OMG love the monkey card! Beautiful cards! Thanks for sharing! I always love Diecember! I really like the brown and white paired with that adorable monkey! Such a cute card!! Cute brown card...love the plaid! I love the "Oh Hello There". Very pretty way to display your cards. What a great way to use that "oh hello there"! I love it! I love the monkey card! I am definately going to have to get the bubble dies. Thank you for sharing. Cute monkey card. Hard to pick a favorite die but would have to say Felicity snowflake....or maybe the collage dies...just want them all! my favorite is your monkey card so darn cute. That dainty, shimmery snowflake is fab and I NEED Oh Hello There!! Cute cards. Love the monkey card. Favorite card is the hello and snowflake on the plaid paper. Such great colors! Very cute cards! 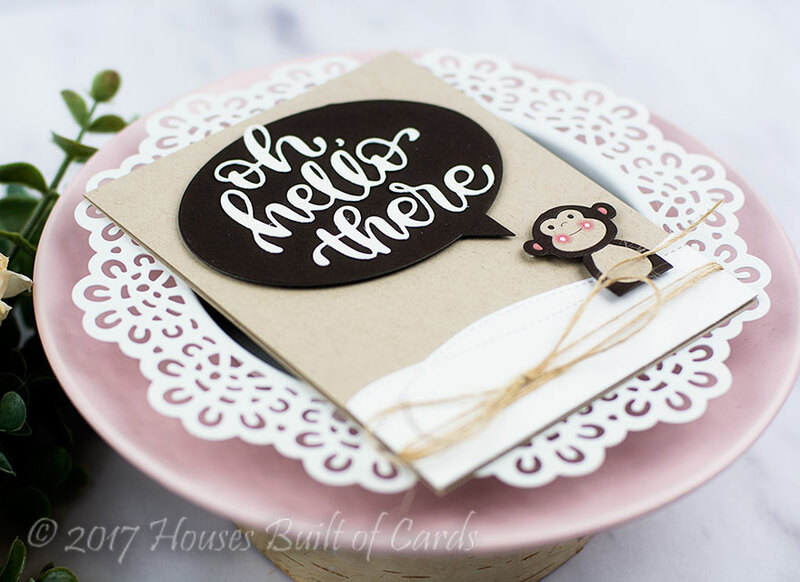 Love the Hello Monkey, and plaid paper with glittery words. thank you for your fun inspirational cards. Cute cards! Love how look the “oh hello there” die. Adorable monkey hello! Love the glittery pink snowflake with the Hello! Love both of your cards! That monkey is adorable and the plaid snowflake card is perfection! nice choice of plaid background for a bit of change. Super cute cards!! Love all of them!! TFS!! Love both of your cards! Great combination of the pink plaid with the pink glitter paper - beautiful! And the hello monkey is sweet! Beautiful cards, love the little monkey! More great dies from SSS! Gorgeous cards, I love the cute little monkey. Your cards are so sweet and cute. So sweet!! Love your cards! Thanks for the inspiration. That little story book monkey is so adorable! Great cards! You used one of my favorite word dies - "Oh Hello There". Nice card. Two beautiful designs! I love the bright colors in your snowflake card and that monkey is too cute. Your cards are so beautiful! I love that monkey die, just too cute for words! I am loving the talk bubble dies too! 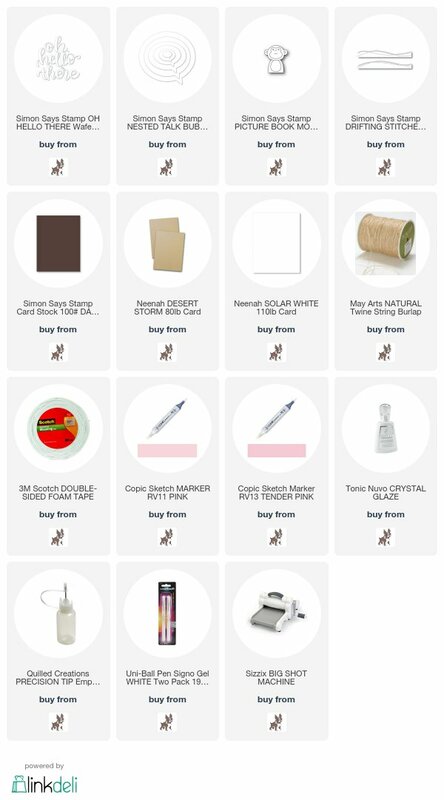 So many awesome products in the DieCember Release!! I want it all!! Wow! Cute monkey and that word die is great! Thank you for the inspiration! The monkey card is so adorable! Thanks! Great cards. The snowflake dies are so pretty. Great cards! The monkey is adorable. Both cards are fun and beautiful. The monkey is cute and i love the beautiful snowflake. Really like the plaid background you used. Really nice! Cute cards, love your monkey card and the non traditional card is very pretty. Cute cards especially the little monkey too cute. Lovely cards. The monkey on the first one is so sweet! Sweet cards - especially the monkey! The little monkey is so cute and love the pink snowflake against the plaid paper. Beautiful cards. Love the card with the monkey..It is mega cute !! love your color choices that pink snowflake is so cute! Cute and pretty cards. Love the monkey. Both cards are so cute. Love the plaid paper!! Very creative! Awesome cards! Love the cute monkey and the Oh Hello There die! Cute card, I love the little monkey! That little monkey is beyond cute!! Your cards are sooooooo Adorable!!!! fun challenge, to only use die-cuts. cute results!! Love your idea of the white letters on the black thought bubble! Sometimes a reversal like that is all it takes to make something stunning! Beautiful cards. Love the plaid with the snowflakes. Very cute. Love both of your beautiful cards Heather! They're amazing! Lovely cards. Love the pink snowflake! Beautiful cards, I especially love the pretty snowflake on the plaid background! Pink snowflakes put a smile on the face. Thanks for sharing. Diecember is awesome. Oh those cards are so pretty.. the plaid background card is stunning! Wonderful cards! Great color! Loved yours a lot. Thanks for sharing your ideas with us. Have a wonderful weekend. Great cards with this fun release! Thanks for sharing with us!! Very sweet cards! Love the sweet little monkey! 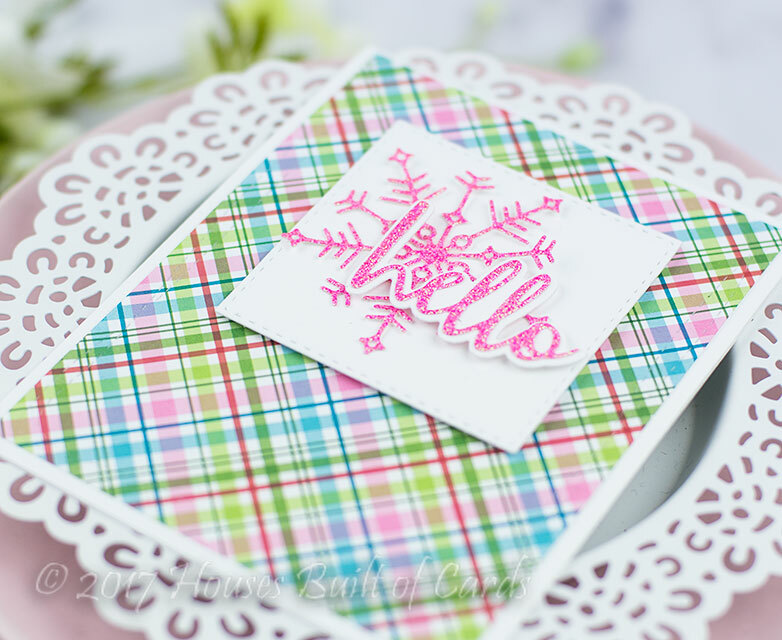 That plaid cardstock is such a beautiful background for your glittery pink snowflake and hello...simple, but very striking!! Great cards! The monkey card is so cute! What a whimsical monkey and I love that sentiment die! Cute monkey with word bubble sentiment. These cards are cute. Thanks for sharing. Both cards were adorable. I love the non-traditional colors for the snowflakes. Love both cards!! The monkey is soooo cute!! I have always liked the plaid paper, never thought of using it with a snowflake for a festive look!! Thank you!! So cute! I especially love the colorful second card. I make most of my cards to send to my nieces, so I immediately wanted to reach through the screen and grab the little monkey card. It is so adorable! I really need to look into these picture book die sets, because each time I see them, they get cuter and cuter. Boy you had me at plaid. So cute! The monkey is so adorable and I loved how you used the oh hello there die for it. I love these dies, but now I need to order the monkey, too. Thanks for sharing. What cute lighthearted cards. Love the colors. The picture book dies are so adorable. I need to get some for myself. Great cards that are for the kid at heart! That monkey is so cute! What fun cards - great inspiration from a fabulous new release. You make such sweet cards! Love the plaid, and the monkey. Thanks. Oooooh so super sweet, the card with the monkey is simply adorable! That monkey is just killing me! And I love the colors on the plaid card. Cute card. Lovely script on that die cut sentiment. Lovely cards! That monkey is adorable! That monkey is just a cutie pie! The monkey card is really fun! Beautiful cards Heather. I love the simplicity of them, not too busy. Love the monkey card. So cute! I love your card and that cute monkey! There's so much to love in this release. That sentiment on the first card is so lovely and the second card is bright and cheery. OH MY GOODNESS... Your monkey card is so stinkin' cute!! Such an adorable card! Love the speech bubbles & can see these dies used year round. The Bubbles & the monkey are both must haves!! The plaid and glitter snowflake is gorgeous! The little monkey card is really cute but the pink snowflake card is just stunning. Good to see and alternative colour for the festive season. Thanks for the inspiration. Monkey card is super cute! Wonderful cards! Your monkey card is so adorable.